University of Evansville Department of Theatre alumnus Rami Malek ’03 won the 2016 Emmy Award for Outstanding Lead Actor in a Drama Series on Sunday, September 18, for his leading role in the USA Network hit Mr. Robot. Rami, who was born and raised in Los Angeles, California, attended UE from 1999–2003 where he had roles in The Real Thing, Othello, Book of Days, Death and the Kings Horseman, and The Kentucky Cycle. Rami’s win was also a victory on a larger scale, as he was the first ethnic actor to win this coveted award since 1998. Rami was nominated with many big name actors like Kevin Spacey of Houses of Cards and last year’s winner, Jon Hamm of Mad Men. After receiving his BFA in Theatre Performance at UE in 2003, Rami went on to book guest appearances on television shows like Gilmore Girls, Over There, Medium, and The War at Home before booking his first feature-length film, Night at the Museum, in 2006 where he played King Ahkmenrah. Rami later went on to book roles in major films including Need for Speed, Battleship, Short Term 12, Larry Crowne, and two additional installments in the Night at the Museum franchise. He also appeared in the television show 24, the HBO miniseries The Pacific, and did voice work for The Legend of Korra. Rami’s latest project and first lead role in a film, Buster’s Mal Heart, premiered earlier this September at the Toronto International Film Festival. Go here to see a video in which he thanks all of his teachers at the University of Evansville. You may experience intermittent outages on the University of Evansville website today as the Web Team is rolling out a new site. These outages are expected due to the conversion process. Michael Austin, University of Evansville executive vice president of academic affairs, will be the speaker at UE’s Constitution Day lecture today - Monday, September 19 - at 7:00 p.m. in Eykamp Hall in Ridgway University Center. Admission to the lecture, which is part of UE’s annual observance of Constitution Day, is free and open to the public. Austin’s presentation will explore some of the major compromises of the Founding era and explain how they were resolved. It will focus on historical and contemporary attitudes toward political opponents and argue that, in the times that our government has worked best, both leaders and citizens have engaged in rigorous political debate without fundamentally delegitimizing their opponents. This is a citizenship skill that is rarely taught but absolutely essential to the society that the Constitution created. Austin earned his PhD in English literature from the University of California at Santa Barbara. He earned his MA and BA degrees in English from Brigham Young University. For more information about the lecture, call 812-488-1150. Fall recruitment for SAI, a music fraternity open to all women with at least one credit of music, regardless of their major of study, begins today. Recruitment will be held today, Tuesday, and Wednesday from 8:30-9:30 p.m. in Room 127 in the Krannert Hall of Fine Arts. Come and enjoy food, friends, and fun! Elizabeth Robertson, consortium instructor of oboe, and Emily Britton, consortium instructor of horn, will present this week’s faculty recital in Wheeler Concert Hall this evening at 7:30 p.m. Robertson and Britton will perform various works by composers ranging from Haydn to modernist French composer Eugène Bozza. Professor of piano Anne Fiedler, pianist Jaime Teichmer, and assistant professor of guitar Renato Butturi will accompany Robertson and Britton. The concert is free and open to the public. We have a special event for you today at I-House. Today is International Day of Peace. We are so excited to share that we have a lot planned for you. From song to prayer and more, we will be sharing how peace is spread throughout the world. Come this evening at 7:00 p.m. upstairs in Ridgway University Center to see how peace and love work together. Hope to see you there! Lunch and Lead: "Who's Getting Your Time?" Lunch and Lead: “Who's Getting Your Time?” is set for today at 12:30 p.m. in Eykamp Hall, Rooms 253-254, in Ridgway University Center. Come join Jackie Luedtke, assistant director for civic engagement and community service, and learn about how to utilize your time to benefit others right here in Evansville. Don't forget to follow up by attending the Volunteer Fair on Wednesday! Lunch and Lead is a free weekly leadership discussion series open to all students, faculty, staff, and guests of UE. Each week, participants are encouraged to bring their lunch and learn about various topics in leadership. EXSS Club will have its first meeting of the semester on Thursday, September 22, at 7:00 p.m. in Room 100 in Koch Center for Engineering and Science. Make connections with upperclassmen, find job and volunteer opportunities, build your resume, and get pizza (if you pay your dues of $5 for the semester or $10 for the whole year)! Circle K will have its first meeting of the year today at 9:00 p.m. in Room 103 in Hyde Hall. This club is all about the volunteering and community service. We are also a worldwide organization, so for you travelers this is a wonderful way to make connections! Humanities and Social Sciences Night is set today in Eykamp Hall in Ridgway University Center. Please join us for an evening dedicated to providing post-graduate information to humanities and social sciences students! 5:00-6:15 p.m. - Internship Showcase: Five students will present their internship experiences to you and a panel of judges. Prizes will be awarded and pizza will be served. 6:30-8:00 p.m. - Speed Networking Sessions: Students can attend their choice of speed networking sessions featuring experienced alumni, and members of the community. The evening will conclude with a reception for students, faculty, and panelists. Dress is business casual. This event is sponsored by the Office of Alumni and Parent Relations and the Center for Career Development in conjunction with academic departments. Contact Career Development at ext.1083 with questions. The UE Newman Club will be volunteering at Seton Harvest on Thursday, September 22. Seton Harvest is an organic farm that gives its food to local food shelters. The event will be from 5-7:30 p.m. If interested in participating, please contact Paige Hignite at ph89@evansville.edu for more info. The Newman Club would like to announce the upcoming Catholic leadership conference called Women of the Church. The event will take place October 7-9 in Ferdinand, Indiana. This conference will acknowledge, support, and honor the work of women in the Catholic Church. Keynote speakers include Carolyn Woo, Kathleen Sprows Cummings, and Mary Catherine Hilkert. The deadline to register for this event is Monday, September 26! Scholarship money is available. Contact Olivia Voegerl at ov4@evansville.edu or Jenny Koch at je46@evansville.edu for more information or go to the conference website. Life is stressful! College life especially so - classes, assignments, friends, relationships, and campus activities can begin to pile up! Stress should not keep you from succeeding. Join UE Counseling Services for a three-part series addressing strategies for managing stress as a normal part of college life! Attendance at all three sessions is encouraged but not required. Sessions will be held in Room 218 in Ridgway University Center from 4:00-5:00 p.m. on September 22 and 29. E-mail em232@evansville.edu to reserve your spot for our September series! The Positive Psychology class is a non-credit offering being hosted on UE’s campus that will meet once a week for six consecutive weeks starting October 11. Join us for this personal enrichment opportunity. For more information please visit the website. College Mentors for Kids has changed its call-out meeting date to Wednesday, September 21. The meeting will be from 3:30-4:30 p.m. If you are attending please apply to be a mentor on collegementors.org, and then join the group to match college students who have the most to give with younger kids who need it the most! For more information, contact the chapter president Myka Goode by e-mail at mg222@evansville.edu. If you have questions or concerns, please contact Jackie Luedtke at jl295@evansville.edu or ext. 1115. One Book One Community of Southwestern Indiana is excited to welcome Kelsey Timmerman, author of Where Am I Eating: A Journey Through the Global Food Economy, to Evansville on Wednesday, September 21, at 7:00 p.m. at the Old National Events Plaza. Have your questions ready for the Q & A after his presentation, and don't forget about the book signing that follows. Bring your own book or purchase one at the event. See you there! For more information, go here or here. This fall the Phonathon campaign is moving from the basement of Hyde Hall to an area in the Center for Student Engagement. To say our staff is excited is an understatement! We would like to thank Geoff Edwards, Dean Clayton, Mike Smith, and all their staff for helping us move and welcoming us into their home. Our campaign begins Monday, September 19, and runs through Sunday, November 20. The Student-Phonathon, managed by the Office of Annual Giving, has many important purposes. Not only does it raise much needed funds for all areas of campus but it also employs over 30 current students. Student-callers thank current donors for their continued support of UE, as well as update all alumni contact information. That information is shared throughout campus to better serve our alumni community. We hope many alumni, friends, and parents answer our call! If you have questions about the Phonathon campaign or would like to make a gift, please contact Jennifer Jacobs at ext. 2021 or jj130@evansville.edu. Planning to take the GRE this year? You may be eligible for a GRE Fee Reduction Certificate. To be eligible, you must be a US citizen or resident alien who is a college senior or an unenrolled college graduate. If you are interested in receiving a certificate, contact Cathleen Wright in the Office of Financial Aid at cw259@evansville.edu and provide the following information: name, ID, type of test you are taking (computer-delivered or paper-delivered), and whether you will be taking a subject test as well. Earn HRA credit by participating in the Fall Healthy Behavior Challenge. Challenge from September 26- November 20. E-mail Ashley Chipps, wellness coordinator, at ac375@evansville.edu to sign up or for more information. Those who successfully complete the challenge will earn $150 in HRA credit. The minimum requirement is 150 minutes of exercise weekly or 1200 points at the end of week eight. Participants record the total number of minutes they exercise daily. They can earn five bonus points for trying a new activity. The weekly exercise logs are then turned in to the wellness coordinator by e-mail or by dropping them into the collection box in the Medical Clinic. Classes will be Thursdays at 6:30 p.m. in the Koch Center for Engineering and Science. Classes are divided into relevance per discipline. Fees are adjusted accordingly. Civil engineering candidates will attend from October 6-February 2. Candidates in mechanical engineering and other disciplines candidates will attend from October 6-December 1. Electrical and computer engineering candidates will attend November 3-December 1. Registration forms and payment must be returned by 3:00 p.m. on Tuesday, October 4. On campus registrations should be returned to Room 250 in the Koch Center for Engineering and Science. Community members may obtain registration information by contacting Kimberly Higgins via e-mail at kh209@evansville.edu or phone at 812-488-2651. David J. Unger, professor of mechanical and civil engineering, has published an article titled "Path-dependent J-integral evaluations around an elliptical hole for large deformation theory in the Journal of the Mechanical Behavior of Materials," vol. 25, 77-81 (2016). 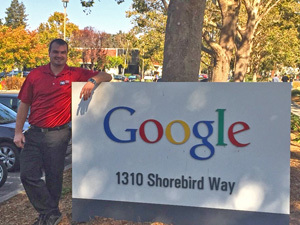 Kyle Matsel, assistant professor of physical therapy, recently traveled to Google Headquarters in San Jose, California, regarding fitness testing. Matsel and Gray Cook, co-founder of Functional Movement Systems, spent two days with the personal trainers, strength coaches, massage therapists, and chiropractors that work with the over 30,000 Google employees in San Jose. Google’s large campus houses over 14 fitness and wellness centers where the employees can exercise and receive personal training. Matsel and Cook introduced the Fundamental Capacity Screen, a battery of tests used to systematically identify performance deficits, to the Google healthcare team and administrators. Assistant professor of mathematics Pengcheng Xiao has coauthored an article that has just been published in the journal Cognitive Neurodynamics. The article is titled "Dynamics of in-phase and anti-phase bursting in the coupled pre-Bötzinger complex cells". Contact the author for a copy at px3@evansville.edu or go here to read it. It is back to the course for the University of Evansville Women’s Golf team as they travel to the Loyola Fall Invitational today and Tuesday. Flossmoor Country Club in Flossmoor, Illinois, will play host to the event. Seven other teams join the Purple Aces in the tournament including: Loyola, Butler, Chicago State, Green Bay, Illinois-Chicago, Indiana State, and Southern Illinois. Monday’s action consists of two rounds with the final 18 holes to be played on Tuesday. An 8:30 a.m. shotgun start will begin play on both days. In the opener two weeks ago senior Kayla Katterhenry brought home a tournament win as she took top honors at the Redbird Invitational at Weibring Golf Club. Katterhenry set the school record with a 7-under 65 in the opening round before carding a 75 in the second trip around the course. On the final day, Katterhenry put the finishing touch on the weekend, shooting a 4-under 68. She finished the tournament with a 208, defeating Butler's Abigail Gleixner by five strokes. Tying for fifty-first was Maggie Camp. She notched a 77 to finish with a 239. Third for the Aces was Giulia Mallmann. After identical scores of 83 in the opening day, the junior lowered her total in the final round by five strokes, registering a 78 to finish with a 244. Maria Pickens was next up for UE. She tied for seventy-first with an 81 in the final round, completing the event with a 245. Lexie Sollman registered an 84 in the last round to finish with a 246. Madison Chaney was the second-best UE player as she participated as an individual. Chaney posted a 78 in the third round, tying for fortieth with a final tally of 234. Teams battled the elements in the 2016 Indiana Intercollegiates as the University of Evansville Cross Country squads ran their second race of the season on Friday in Bloomington. With the races delayed over an hour due to afternoon storms, the racers took to a wet and muddy course. Times for all racers checked in a little behind the usual pace. Conditions prior to the event were so inclement that other team buses were stuck in muddy areas near the course. Sienna Crews was the top finisher for the women. She came home in twenty-second place with a time of 19:30.90. She finished ahead of Hannah Welsh, who circled the 5K course in 19:39.20. Welsh finished twenty-ninth. The duo also led the Purple Aces in the EIU Walt Crawford Open, which was held two weeks ago. Third on the team was sophomore Ashton Bosler. She crossed the line in 21:07.29. Six seconds off of her pace was junior Michelle Karp. She finished the 5K in 21:45.49. Anna Loef was next. She registered a time of 22:46.91. Rounding out the squad were August Martinez (24:11.35), Katie Beaber (24:20.03), and Hayley Elliott (26:23.77). For the second time in as many tries, freshman Ricky Hendrix was the top runner for the men. He came home in thirty-sixth and completed the 8K race in a time of 28:20.69. Stanley Chepchieng was second on the squad. The newcomer continued to impress as he ran a 30:02.08. Two weeks after setting his PR, junior Paul Schwartz took third on the team. He circled the course in 30:04.23. Schwartz finished seven seconds ahead of Ross Frondorf, who recorded a 30:11.21. Andrew Barrett cross the line in 30:42.49 while freshman Tucker Dawson ran a 31:00.72. Ben Woolems (31:35.47), Aaron Cochran (32:00.14), and Jonathan Newby (33:02.04) finished off the UE contingent. Evansville will be right back on the course on Saturday, September 24 as the squads head south to Clarksville, Tennessee, for the Austin Peay Invitational. Junior Cathy Schreiber garnered Gamecock Invitational All-Tournament honors as the University of Evansville Volleyball team finished up the weekend with some momentum, defeating Nicholls State by a 3-1 final. In Saturday’s opener, Evansville (4-9) fell to Jacksonville State in a 5-set match. Mildrelis Rodriguez led the way in the win over Nicholls State, posting 15 kills and 14 digs. She was one of four Aces players to record 10 or more digs. Olivia Goldstein notched 17 while Rachel Tam had 12 and Jelena Merseli had 10 to go along with her 32 assists. Rodriguez continued her solid play with six kills in the first set as the Aces topped Nicholls State, 25-20, to take a 1-0 lead. Despite trailing 5-1 in the early going, UE rallied back to tie it up at 11-11. The run continued as a 10-2 stretch gave Evansville a 15-12 lead. From there, the Aces hung on for a 25-20 win. The Colonels came back to take a 25-19 win in the second frame to tie the match up at 1-1. Evansville did not let the bump in the road phase them as they fought back for a 25-17 win in the third game. The turning point came with the scored tied at 3-3. Following a NSU error, Rodriguez notched a kill to give her squad the lead for good. Evansville extended the lead to 10-5 on a Schreiber kill. The Colonels cut the deficit to three at 20-17, but the Aces reeled off the final five points to take the 2-1 match lead. A fifth set appeared to be on the horizon as Nicholls State took a 15-9 lead in the fourth frame. The Purple Aces showed their fight as Rocio Fortuny did the serving to get UE back on top at 18-17. NSU scored three in a row of their own to retake the 20-18 advantage. Some more late magic was needed for the Aces to finish. Trailing 21-20, Goldstein did the serving as the Aces finished on a 5-0 run to earn their fourth win of the season. Rodriguez had the best offensive game of her career in Saturday’s opener, registering 20 kills in 61 attempts, both career highs. Cathy Schreiber and Rachel Tam each notched 11 kills while Tam also had 19 digs. Jacksonville State dominated the first set, taking a 25-15 win, but the Aces had the answer in the second frame, winning 25-20. With the score tied at 3-3, Evansville went on a 10-5 stretch to open up a 13-8 lead. The Gamecocks came right back with five of their own and later took an 18-17 advantage. The Aces fought back again as a Schreiber kill and Tam service ace gave UE the lead for good as they rallied for a 25-20 victory. A 3-1 start to the third set was enough to see the Purple Aces to cruise to a 25-19 triumph in the third game. JSU got within one at 8-7, but the Aces came right back with an 8-3 rally to go up 16-10. Schreiber accounted for a pair of kills in the run. Evansville kept it rolling from there as Olivia Goldstein capped off the game with two service aces. The fourth set saw a battle go down to the wire. The Gamecocks took a 23-02 lead, but kills by Jelena Merseli and Erlicia Griffith got UE within one before Tam tied it up at 23-23. JSU was able to respond, notching the final two kills to force game five. A 5-1 run opened up the set for JSU and the continued to lead at 13-10. Just when it looked like the match may be over, Evansville came back, scoring four in a row. Rocio Fortuny had a kill as UE took a 14-13 lead. Neither team relented and fought to a 16-16 tie. That is where JSU was able to finish it off, scoring the final two points to clinch the win. Missouri Valley Conference play begins next weekend for the Aces, who welcome Drake to the Carson Center on Friday before hosting UNI on Saturday evening. Diana Tkachenko was victorious in the main draw singles at the second flight as the University of Evansville Women’s Tennis team wrapped up the Greater Cincinnati Invitational on Saturday. Tkachenko won both of her matches on Friday and overcame a loss in the first set to defeat Klara Skopac of Northern Kentucky, 3-6, 6-4, and 10-8. In doubles play, the duo of Leah Helpingstine and Andjela Brguljan were victorious in the third flight. They defeated Anna Delaney and Claire Herdina of Dayton, 6-4. At #1 doubles, Chieko Yamada and Andrea Pascual-Larrinaga fell to Duquesne, 6-3. Second-flight doubles saw Theodora Soldatou and Daria Pentsova, who lost to Eastern Kentucky by a 7-6 final. Evansville will be back on the court on October 1 and 2 at Wesselman Park when they host the Evansville Metro Collegiate Invitational.